Get a copy of our FREE gender teaching resources and support women and girls living in poverty. To support your fundraising and inspire your students to support CARE’s work with women and girls, we have developed some teaching resources that will help teachers effectively bring the topic of gender equality into your classroom. 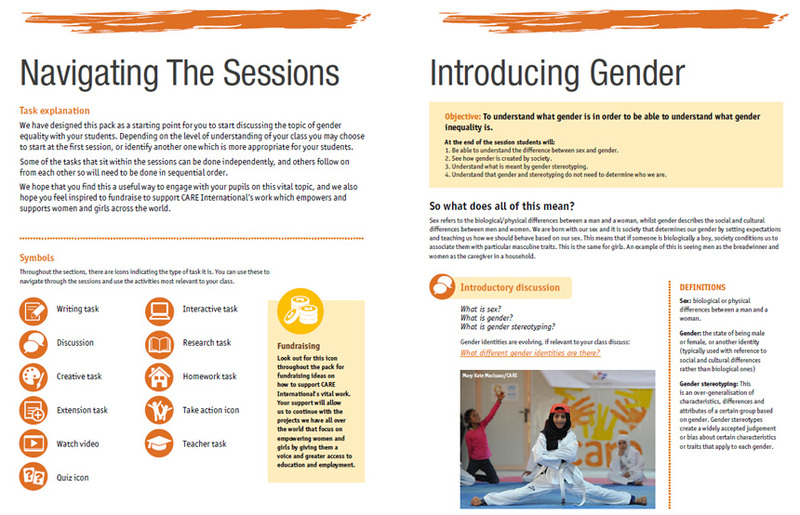 CARE’s gender teaching resources are a great way to encourage students to engage with women’s right and gender issues by reflecting on their own identities and relating this to women and girls around the world. There is not a single country in the world that has achieved complete gender equality. In many countries, the lives of women and girls are constrained by vulnerability, poverty and cultural norms that limit their opportunities. CARE’s gender teaching resources encourage students to reflect on inequalities within the UK, see the inter-relationship between the issue in the UK and globally – and, we hope, motivate students to support the work that CARE is doing to empower women and girls across the world. A recent survey revealed that 64% of girls and young women aged 13 to 21 say they have experienced sexual harassment at school. This includes sexual taunts and unwanted touching. This shows that there is no better time to educate young girls and boys on how to recognise and counter social norms and discriminatory attitudes which exist within our society and more globally. As well as using these resources to open up discussion in fun and interesting ways, we also encourage your school to organise a fundraising event to support CARE International’s work with women and girls across the world. It is often by making the link with the lives of those in other countries, and seeing that they can make a difference, that students can be drawn into activism in the local and global context. I hope that the contents will help you engage and inspire your students on a topic I am very passionate about – that of women’s rights and gender equality. Please the Fundraising Events team on events@careinternational.org to receive our FREE gender teaching resources and start fundraising with your school today!